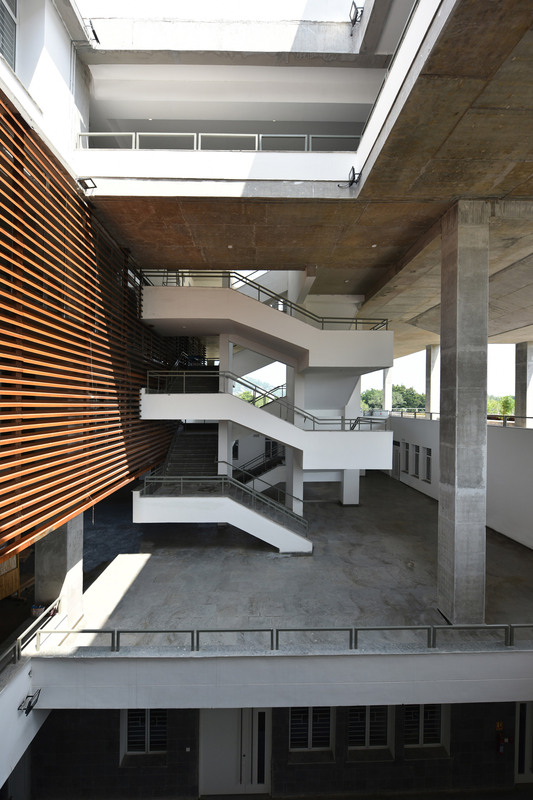 Floating staircases connect teaching spaces in the Brutalist-style monolithic concrete School of Planning and Architecture Vijayawada by Mobile Offices in India. 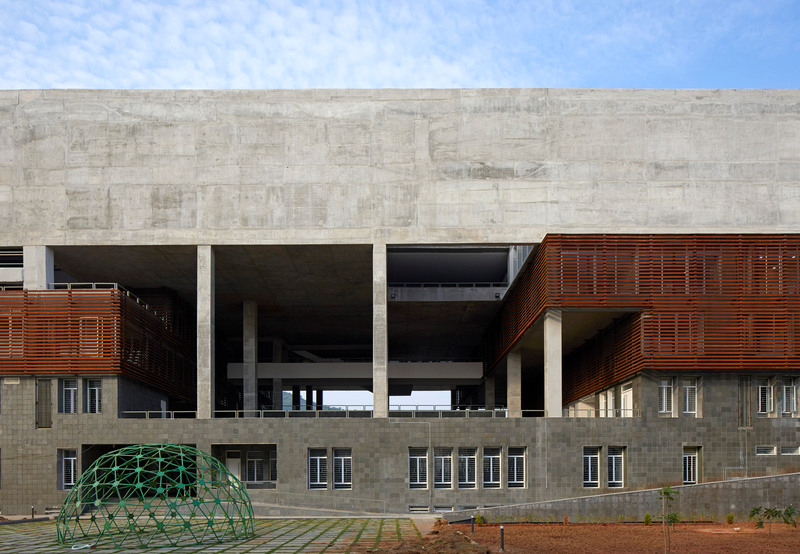 The architecture school is located on an eco-friendly campus in the city of Vijayawada, in the southeast Indian state of Andhra Pradesh. 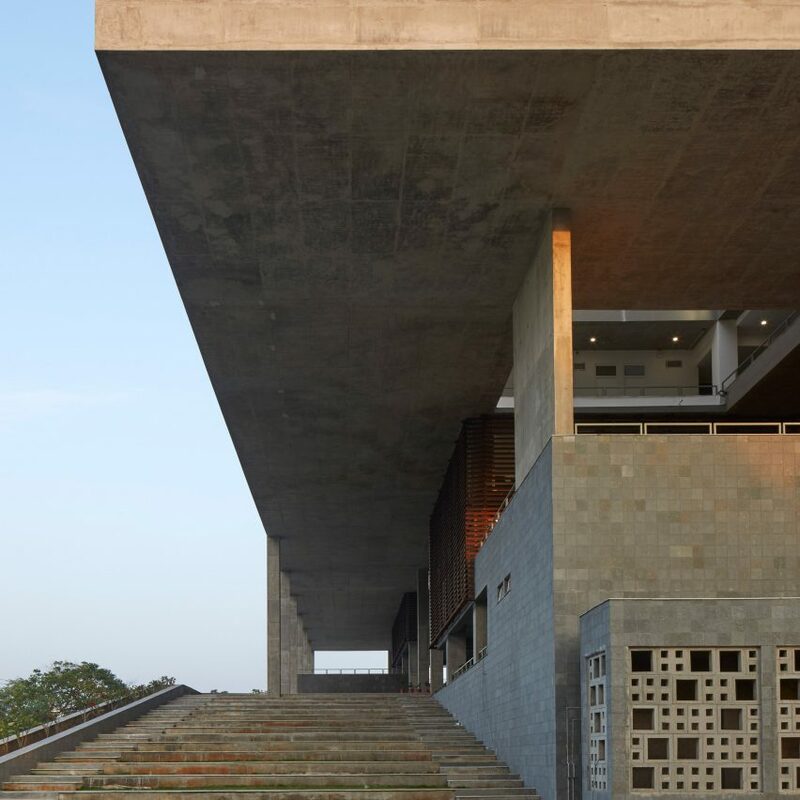 Mobile Offices – a Mumbai-based studio headed by Manisha Agarwal and Shantanu Poredi – designed the School of Planning and Architecture Vijayawada to pay homage to basic forms, simple materials and “austere ideologies” of Brutalist architecture. “The design demonstrates a scale akin to a public building on the outside and the inside explores the didactic nature of space by creating a humane scale apt for an engaged student community,” said the architecture studio. Voids puncture the large volume of the school to allow light and air to penetrate, as well as breaking up the overall scale to create a variety of spaces suited to different programmatic functions. The rectangular plan is extruded vertically and is separated into three sections, described by the architecture studio as the Parasol, the Concourse and the Platform. These three levels are further divided to create a three-dimensional configuration of volumes that responds to the diverse uses of the spaces and circulation requirements. 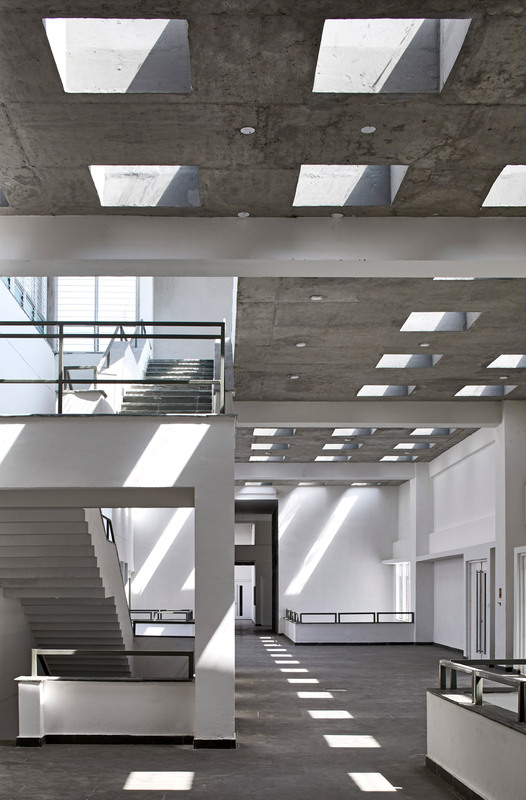 The top level of the building acts as a roof – or parasol – that provides shade to the spaces below. This layer also contains classrooms and studios, typically used for the morning curriculum when it is less hot. 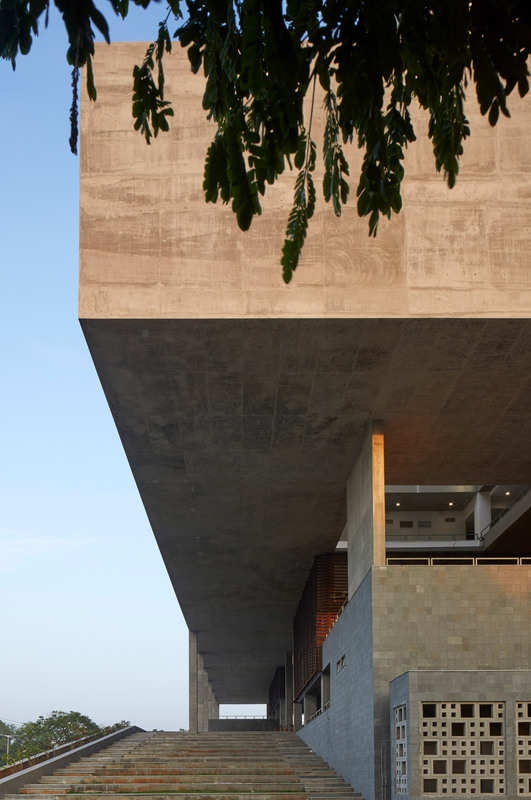 A “stilted platform” forms the middle section, which contains a series of interconnected open-air spaces for communal activities that are reminiscent of traditional courtyards. This concourse level contains circulation areas that assist the movement of people around the building. Floating staircases and walkways are interspersed between structural pillars and light wells that provide a visual connection between the various layers. Circulation areas include a double-helix staircase that is designed to maximise the stair width in order to enhance the experience of movement. The two stairs intertwine and lead the users to the same levels simultaneously without intersecting. Stepped terraces along the northern side connect the ground level with the concourse. An auditorium with raked seating is accommodated beneath this gently sloping surface. Local Tandur stone has been used for the base of the building. It houses workshops and laboratories used for the afternoon programme of the teaching curriculum. The stone surfaces reduce the build up of solar heat gain throughout the day, while voids incorporated into the solid volume allow hot air to escape. 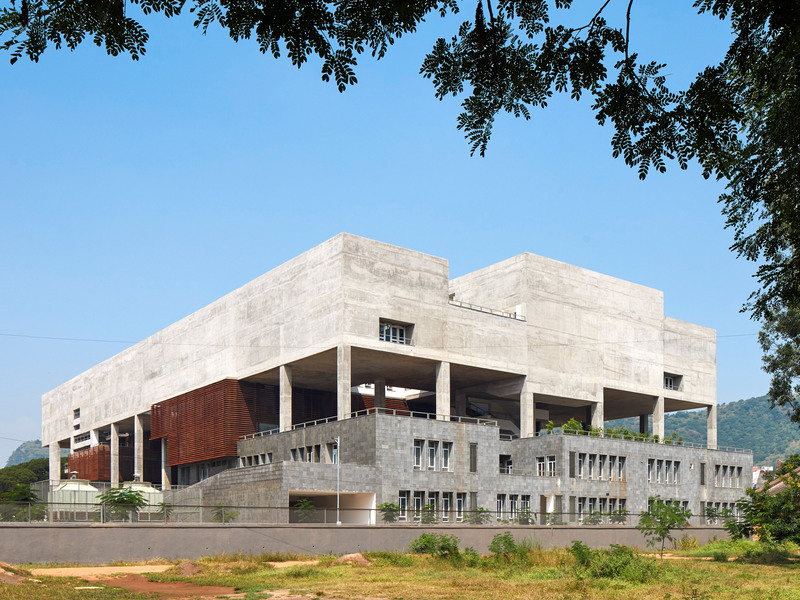 Mobile Offices used a pared-back material palette comprising exposed concrete together with fly-ash bricks, stone and weathered steel to give the School of Planning and Architecture Vijayawada a simple appeal. Keeping educational facilities cool in India’s hot climate poses a particular challenge to architects. 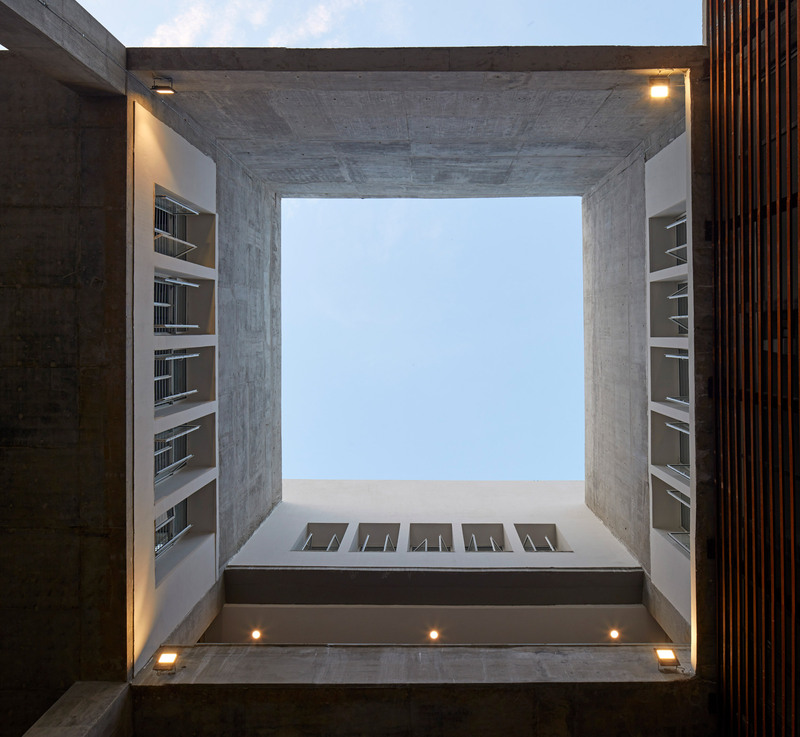 Indian architecture studio Morphogenesis rebuilt a school in New Delhi that has perforated walls and subterranean teaching spaces to encourage breeze and keep students cool. Sameep Padora & Associates created a vaulted brick ceiling from bricks for a children’s library in Kopargaon that visitors can walk over as well as shelter under. 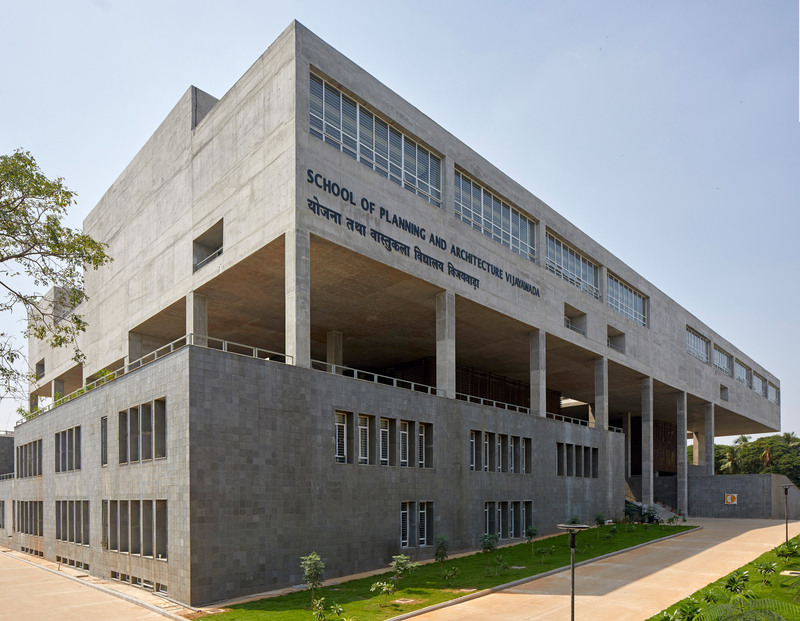 The post Mobile Offices designs Brutalist concrete architecture school in India appeared first on Dezeen.